Chickpeas (hummus in Arabic) are an essential ingredient in Moroccan kitchens, where they're used in a number of traditional dishes ranging from couscous to stews to pureed dips or soups. The vast majority of Moroccans use dried chickpeas rather than canned, as the former are considered to have superior texture and flavor while also being more affordable. 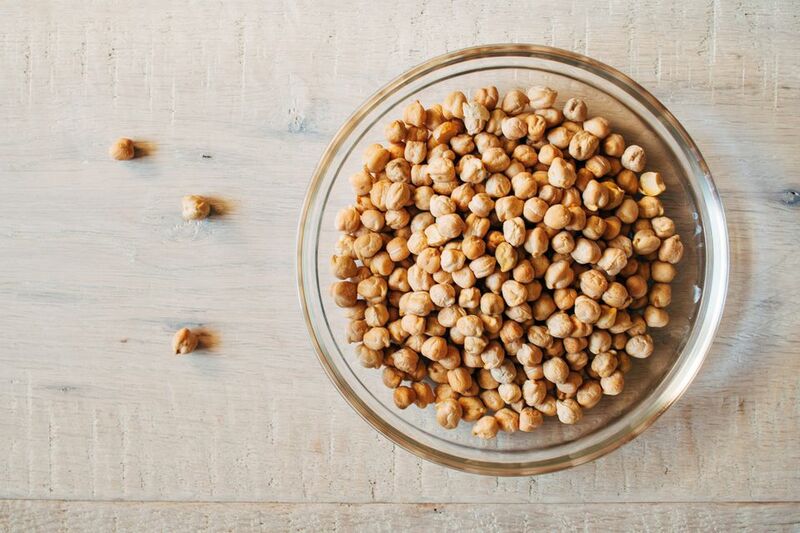 Before they can be used in Moroccan recipes, dried chickpeas must first be soaked and sometimes peeled or even cooked. Dried chickpeas need to be soaked before they're cooked. Place the beans in a large bowl, generously cover with cold tap water and leave them to soak at room temperature overnight (or for at least eight to 12 hours). Some non-Moroccan cooks recommend adding a teaspoon of baking soda per liter of soaking water; I don't bother, but you may find that it facilitates the loosening of skins or yields a more tender cooked garbanzo bean. Or, for a quicker method, drop the dried chickpeas into a pot of boiling water, cook for a minute or two, and then leave to soak off the heat for an hour. If using baking soda with the quick soak method, add it after removing the chickpeas from the heat. After they have soaked, drain the chickpeas. Be sure to rinse extra well if baking soda was used. Some Moroccan recipes such as harira also require peeling the chickpeas. The soaked chickpeas will need to remain wet in order for the skins to slip off, so work with drained chickpeas quickly. If you intend to peel a large quantity, keep the chickpeas in a bowl of water and remove them by handfuls for peeling. To peel, roll and pinch the soaked chickpeas one-by-one between your forefinger and thumb to snap off the skin. Another roll and pinch may be necessary to remove the second layer of skin. You will find that some chickpeas break in half during this process; this is not a problem, and the chickpeas are fine to use. Another method is to place a large quantity of soaked, drained chickpeas between two kitchen towels and massage against a hard surface such as a counter or table. This will loosen the skins from most of the chickpeas. Similarly, some Moroccans traditionally roll the soaked chickpeas against the rough surface of a woven platter-like basket called a tbeq. Like the kitchen towel method, it is effective, but I find that a large number of chickpeas end up in small pieces, and I don't like the resulting mess. If a recipe calls for plain, cooked chickpeas, place the soaked beans in a pot and cover with ample salted water. Bring to a boil, cover, and simmer for 60 to 90 minutes, or until the chickpeas have cooked to desired tenderness. Drain and use as required in salads, soups, and other dishes. You can also cook chickpeas in a pressure cooker. Add the beans to salted water in the cooker, cover tightly and bring to pressure over high heat. Reduce the heat to medium and cook for approximately 45 minutes, or until tender. Soaked chickpeas with or without skin may be stored in the freezer for up to a year. Leave the chickpeas to drain thoroughly before transferring them to a freezer bag. Cooked chickpeas may also be frozen. Again, drain thoroughly and transfer to a freezer bag for up to six months. Chickpeas swell in size after soaking and again after cooking. One cup of dried chickpeas will yield approximately 2.5 cups of soaked beans or 3 cups of cooked beans.